There are already tens of millions of e-book lovers, and their ranks are sure to be boosted by the latest iPad, tablets, Smart Phones — along with improved ebook reading devices available in the market at present. In a society where bookstores disappear every day while the number of books available to read has swelled exponentially, libraries will play an ever more crucial role. Even more than in the past, we will depend on libraries of the future to help discover and curate great books. Libraries are already transforming themselves around the country to create more symbiotic relationships with their communities, with book clubs and as work and meeting spaces for local citizens. For publishers, the library will be the showroom of the future. Ensuring that libraries have continuing access to published titles gives them a chance to meet this role, but an important obstacle remains: how eBooks are obtained by libraries. 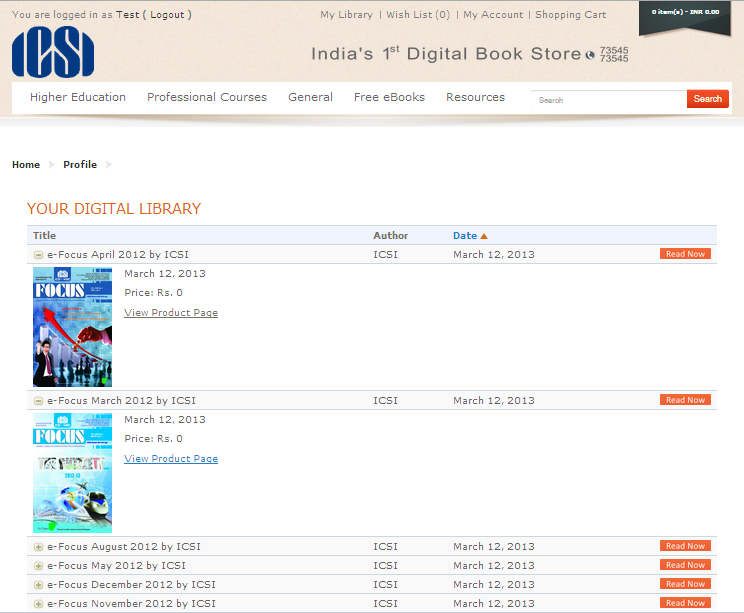 ICSI becomes the first organization where Kirjasto was implemented. Depicted below is the screen shot of the library and the way it will look. How to Install Kirjasto ? Kirjasto can be installed in minutes in the library or for the organization. Just call + 91 73545 73545 or shoot a mail to info@kopykitab.com. However, looking at the increased demand we have decided to implement it in only top 25 Institutes and organizations across India. This will enable us to provide better services to the institutes where Kirjasto is installed.